It is sad, the passing of Jack Kemp, good man, good football player and Leonard Pennario fan. That is a picture of Pennario and Kemp up above. It is touching how Kemp identifies himself as Pennario's No. 1 fan. This is how one track my mind is. Lastnight I am on the phone with our city editor at The Buffalo News because I was turning in something I had written. And I said, "I hope I'm not sending this in too late. I know how busy you are." He said, "Well, yes, Jack Kemp died." I said: "Oh, that is terrible! Leonard Pennario was friends with Jack Kemp." Which was true. Perhaps "friends" was overstating things, but they were mutually admiring acquaintances. Pennario contributed to Kemp's campaigns and causes, and Kemp used to go to his concerts. But here is what I felt bad about later. Obviously what the editor was trying to say to me was: "Jack Kemp died and so yes, Mary, I am totally busy, so thanks for the review, and just let me off the phone, OK?" And all I could think about was Leonard Pennario! I am lucky I did not lose my job. This was my dumbest moment all week. Well, as usual the competition has been keen. There was Thursday night when Howard and I went to hear Jackie Jocko and after I had two glasses of wine Jocko introduced me to the great flutist Emmanuel Pahud. But that story will have to wait for tomorrow. I cannot bear to think about it now. That is how stupid it is! Back to Jack Kemp. 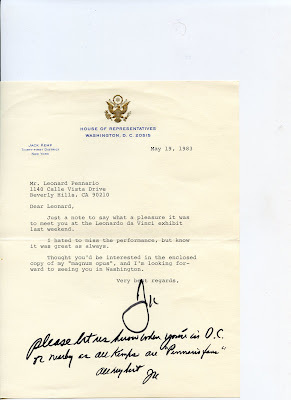 He sent a couple of letters to Leonard and here is one. It's cute how Kemp writes that all the Kemps are Pennario fans. It is nice to think that up in heaven Pennario is playing for him right now. 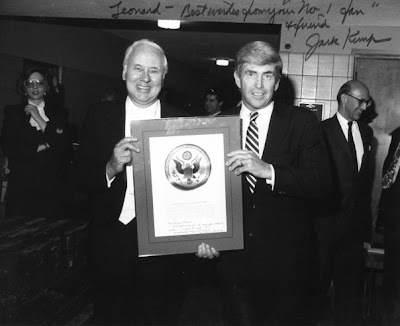 The passing of Jack Kemp is very sad. The BPO review was very good.